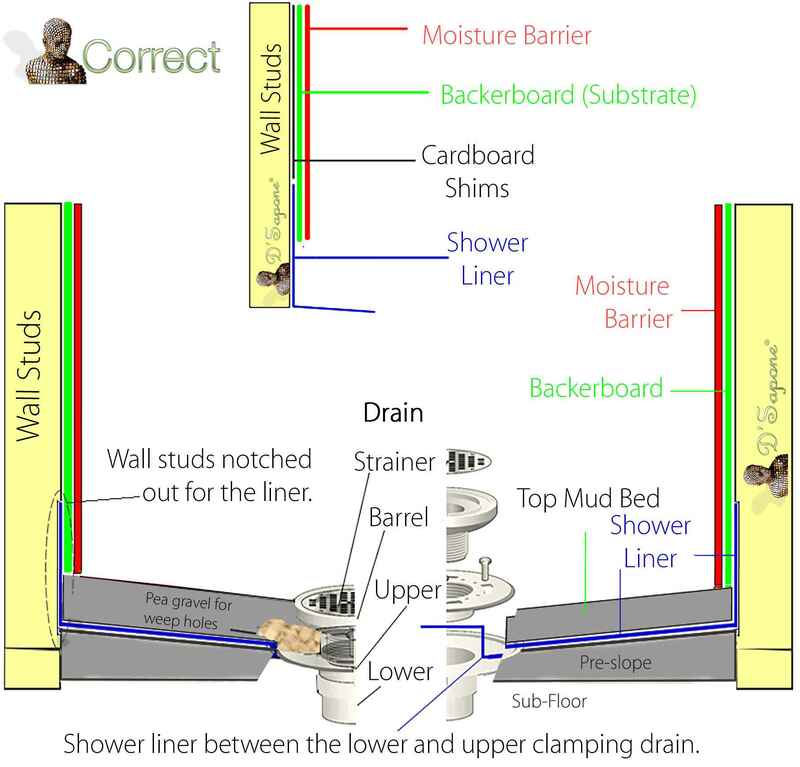 This diagram is showing you a traditional properly installed shower pan.This successful installation has a pre-slope, which allows the water to travel toward the weep holes when it penetrates past the tile, grout and caulk. Pea gravel is placed around the weep holes to allow water to pass through.The combination of this not only allows water to flow to the pea gravel and week holes, it allows the access water to escape via the unclogged weep holes. Waterproofing of the mud bed. 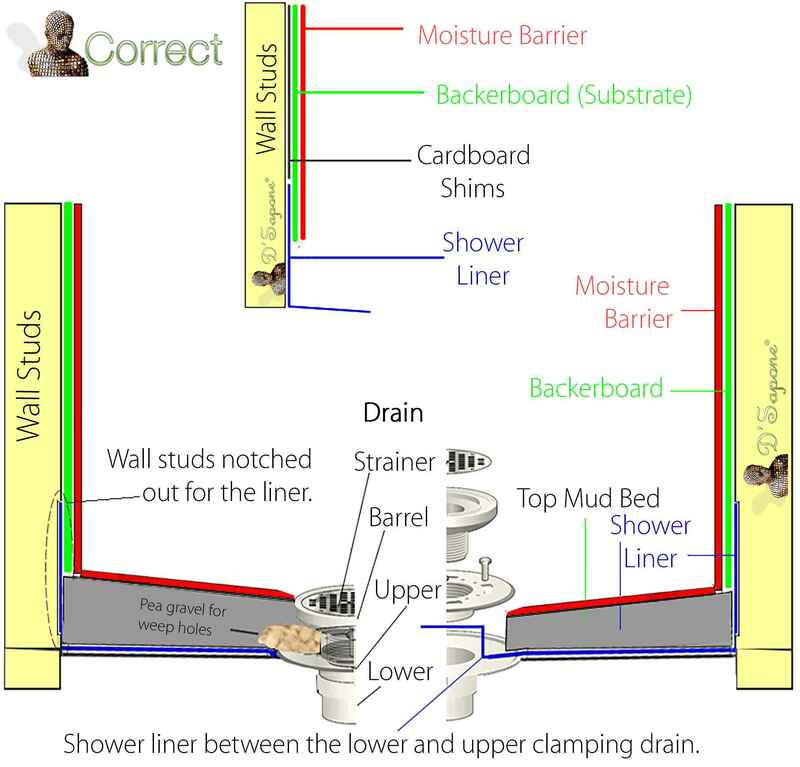 This diagram is showing a correct shower pan installation with the top of the mud bed waterproofed. This installation prevents water from traveling past the top of the mud-bed preventing leaks. Any water that passes through the grout and caulk will stop at the waterproofed membrane and travel to the drain.The waterproof membrane is a liquid form, which is brushed on or a membrane sheet that is adhered to the top of the mud bed. 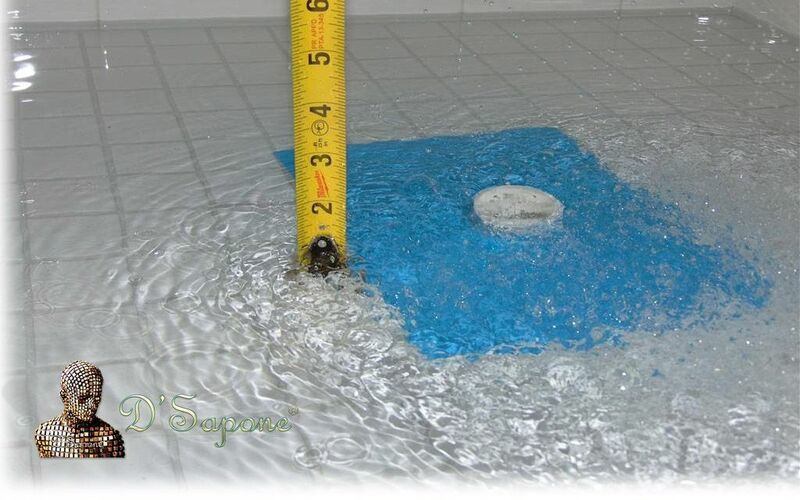 The shower pan acts as a secondary waterproofing cathing any water that passes through the top liquid waterproofing. 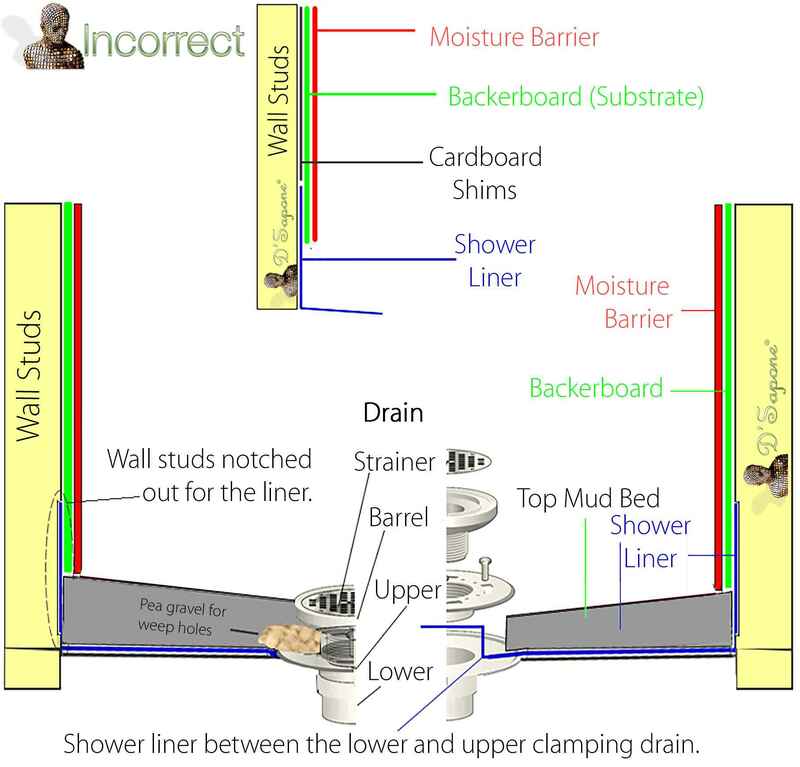 This diagram is showing you a faulty shower pan installation, with no pre-slope and clogged weep holes. Unfortunately, the pre-slope is a very important and most forgotten step, which allows water to lay stagnant under the tile. Additionally, weep holes are crucial for allowing water to escape the pan through the secondary drain.Without correctly installing the shower pan, it will hold water and potentially cause leaks and efflorescence. Notice the images below that show the issues caused by a shower liner (pan) installed incorrectly. and mildew under the caulk. Due to the shower pan retaining water because there is no pre-slope or waterproofing ontop of the mud bed, moisture starts the mold and mildew growth under the tile corners. 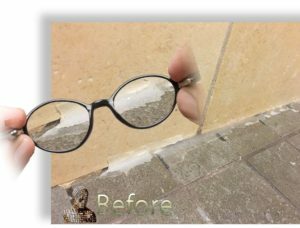 D’Sapone can rectify this issue by removing all the caulk and replacing it with Sentura (flexible 2 part epoxy/reisn) and sealing all the grout lines with Caponi® (2 part titanium pigmented grout sealant). This process will ensure that the waterproofing starts now above the tile preventing water penetrating past the surface. D’Sapone knows that the quality of waterproofing is what counts – so we count on a dry clean surface. 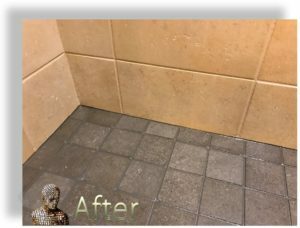 With all the minerals in water that can’t drain due to the improper shower installation – the minerals in water mix with the minerals in the concrete and grout – causing efflorescence occurs. Our artists can even prevent efflorescence from occuring by removing it from and under the edges of the surfaces, then sealing the shower with Sentura and Caponi®. We can test your shower pan to find leaks. If the shower is leaking outside or underneath, then we can perform a shower pan test. 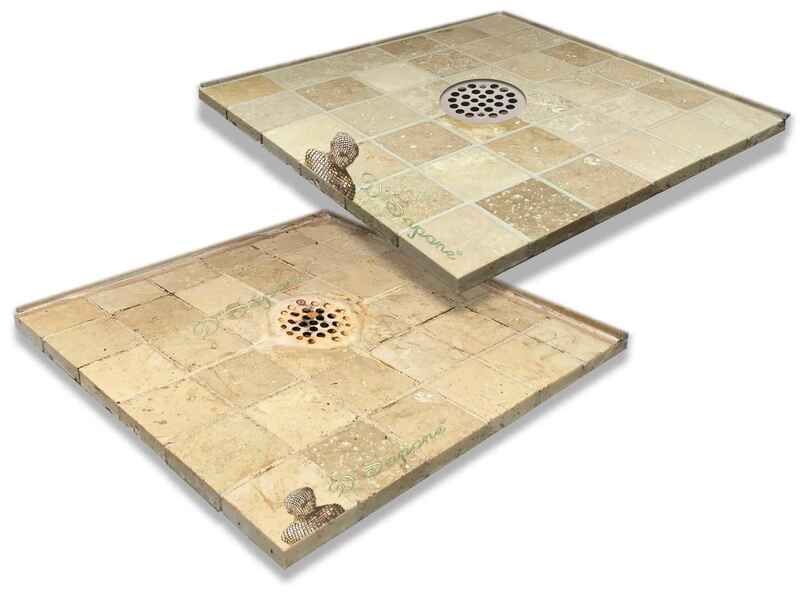 A proper test is conducted by temporarily plugging the drain below the weep holes using a flexible rubber ball and filling the shower with water.The drain must be plugged below the weep holes to allow water to flow underneath the tile and not escape through the weep holes. We will leave the shower pan test in the drain for 24 hours to allow enough time to leak. If water starts to leak, this will indicate a faulty shower pan.